How's it going everybody, I wanted to share with you the technology trends that are on the rise in 2014 and how these trends effect business and our lives. Physical and digital worlds are converging. As a result consumers expect uniform service whether they are in the physical world or if they are in the digital world. 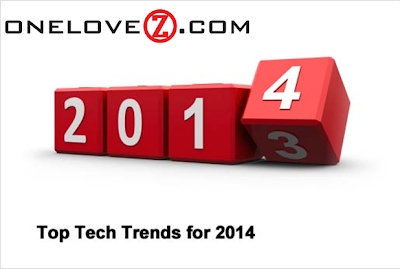 The convergence of the business and personal use of technology is also fueling this trend. Forrester points out that “A great digital experience is no longer a nice-to-have; it’s a make-or-break point for your business as we more fully enter the digital age.” The report points to a growing number of firms that have chosen a mobile-first approach, but then falling flat because “systems of record cannot keep up with engagement needs.” To a greater extent, customers’ impressions of a business are established through digital engagement forcing businesses to recognize that “software is the brand.” Some CIOs are losing their influence over the decisions in these areas as digital experience agencies are engaged by chief marketing officers and chief technology officers to a greater extent than by chief information officers. IT is losing its control over business intelligence platforms, tools and applications often due to IT’s inability to operate at the increased pace of the business. The report also notes that business process management, again a traditional domain of IT by-and-large, is increasingly becoming the domain of other functions as “a new class of users demands more user-friendly, self-service features to automate ad hoc processes without expensive and scarce IT resources.” As mobility increasingly becomes a strategic imperative of the entire business greater, levels of process and data innovation should arise, again leading to various functional leaders to wrestle control away from IT. There is a comparison between service-oriented architecture (SOA) and applications platform interfaces (APIs). Like the former, the latter provides “open access to useful functionality through network-based services using technologies that are readily accessible from a broad range of programming environments.” The report sites as examples Amazon.com's product advertising API and the Washington Metropolitan Area Transit Authority’s API which represent business model innovation under this paradigm, while also highlighting the need for ever more sophisticated security given the exposure of data to a much broader set of individuals. Than you for taking a moment to read this and also taking a moment to increase your knowledge.